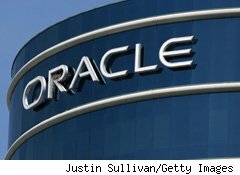 Shares of Oracle (ORCL), the second-largest software company, fell in after-hours trading after the company reported quarterly results that met Wall Street expectations but failed to wow investors concerned about spending on business technology. Net income fell 10.5 percent to $1.19 billion, or 23 cents a share, from $1.33 billion, or 26 cents, a year earlier. Revenue before adjustments rose 17 percent to $6.4 billion. Excluding one-time items, profit was 38 cents, meeting the 38-cent average expectation of analysts surveyed by Bloomberg. The earnings were boosted by the $7.4 billion acquisition of Sun Microsystems, which closed in January following a lengthy regulatory review. New software license revenue climbed 13% to $1.7 billion, and 10% to $1.7 billion excluding Sun. Software license updates and product support revenue rose 13% to $3.3 billion. "The Sun integration is going even better than we expected," said Oracle President Safra Catz in the earnings press release. "We believe that Sun will make a significant contribution to our fourth-quarter earnings per share as well as meet the profitability goals we set for next year." The shares slipped 31 cents, or 1.2%, to $25.73 at 6:19 p.m. in extended trading after the earnings report. Oracle, which CEO Larry Ellison cobbled together from acquisitions of 62 companies valued at $41.8 billion since January 2005, has a tough road ahead. Most analysts are expecting a modest rebound in technology spending as the economy continues a recovery that economists say is weak. The company, though, should benefit from companies that are revamping their IT departments because they expect a rebound. "The acquisitions they've done in middleware are paying off," said David Rudow, a Minneapolis-based analyst with Thrivent Asset Management, in an interview with Bloomberg News. "These are programs for the data center that you have to spend money on to run your business better." Indeed, if anyone can navigate the treacherous economic waters, it's the wily Ellison, who also is a passionate sailor who has long been associated with the America's Cup race. It's a hobby that will serve him well.